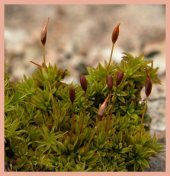 The Pottiaceae family form the most numerous moss family known, containing nearly 1500 species or more than 10% of the 10000 to 15000 moss species known (Buck and Goffinet 2000). It is widely distributed in the world in a great diversity of environments, mainly in temperate and mountainous regions. Many of them are especially adapted to dry climates and they are often the dominant mosses in arid regions of the world. However, taxonomic treatment of the family has been notoriously difficult due to problems of polymorphy, the unclear significance of several anatomical characters, the reduced size of many species, obscure areolation and the sterility of many specimens (Zander 1993). In addition the lack of updated regional treatments available, especially for tropical areas and few revisions have done that Pottiaceae has been considered a complex and taxonomically difficult family. The purpose of this website is to provide a better knowledge that allows attenuating the hard identification of the Pottiaceae family, in which the authors of this page are working from several years ago. In the future, the site will be expanded with the results of our research, supported by a data base system in order to improve its consistence and accessibility.